Typical whitetail bucks are called "typical" when describing their antlers or rack. The term "typical" is a scoring term used by the Boone and Crockett and the Pope and Young clubs to define a set of antlers for logging into the record books. 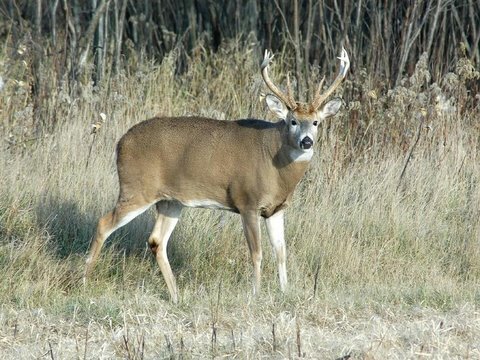 The Boone and Crocket rules allow scoring of a deer no matter how it was killed. The Pope and Young club requires the deer must have been killed by a bow and arrow. For both clubs the only way the antlers scoring will count is if the deer is killed legally according to all the area hunting regulations. In order to compare racks there has to be a method of standard comparison. It can be a bit confusing, but Typical Whitetail Bucks have a symmetrical rack that may have non-typical features. During scoring, points are deducted for those antler features which are not symmetrical. The scoring is based on a point system which is calculated after taking a series of antler measurements. Both Boone and Crockett and Pope and Young use a scoring system, but the number of minimum points for being entered into the record books is different. For Boone and Crockett the minimum scoring points for whitetail deer is 160 inches. For Pope and Young the minimum for whitetail deer is 125 inches. There are also minimums for non-typical antlers. In some states the typical whitetail bucks are well . . . typical. In other words, most of the bucks have symmetrical antlers. When scoring the antlers, the measurements document points and spreads. The points, of course, are the projections growing out of the main antler stems, or beams, as they are called. The spread is the distance between designated points. Both the Boone and Crockett and Pope and Young clubs have online scoring sheets which describe exactly where to take the measurements. If your typical whitetail bucks total score meets the minimums, it will have to be verified by an official from the club. It should be mentioned there are two other clubs that score whitetail deer. The Buckmasters and the Longhunter clubs maintain official records. The Longhunter records are for deer killed with a muzzle loader. The Buckmasters scoring counts every inch of the antlers and does not focus on visual aesthetics. Typical whitetail bucks are animals of beauty to an avid hunter. It's a great source of pride to have your buck listed in the Records of North American Big Game. If you're looking for whitetail deer information, you've come to the right place. I'm working all the time on the site and adding information all the time about the Whitetail. My idea for the site came from the fact that most hunters of whitetail deer believe you have to harvest a monster buck deer to be a good Whitetail Deer Hunter. I have watched a ton of shows on T.V.over the years and do not ever recall anything mentioned about the fact that any Whitetail Deer Harvested is to me a trophy in its own right. We all have to know or understand it takes a lot of work and knowledge to be successful in this sport. Over the years I have learned a lot of information about the Whitetail Deer and hope to put it here to help others to learn to hunt what I believe it the greatest most magnificent creature God has given us to enjoy in many ways. Thank you for coming by and please feel free to contact us with your comments both good and bad. Help us to help you become the best Whitetail Deer Hunter you can be. For more information about us follow the link below. And if you have suggestions on how to improve this site feel free to contact us. Expert trophy whitetail deer hunting tips and advice to help both novice and seasoned hunters improve their trophy hunting skills. 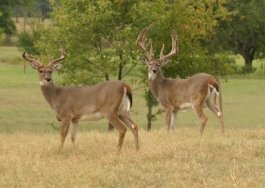 Having good whitetail deer information can improve hunting success while enhancing the sporting experience. You can learn many tips concerning fawn, doe and buck behaviors and successful hunting. Should you find a fawn PLEASE LEAVE IT WHERE IT IS. It is not abandoned by its mother. The mother is out feeding and left her fawn or fawns in what she considers a safe place. Please use the contact us page for any questions or comments you may have. We may post them on our site with a reply. You will also receive a personal reply from us. We want to make this site as relevant to your needs as we can. Just let us know how we can help you. And thanks for stopping by. Have a great day.